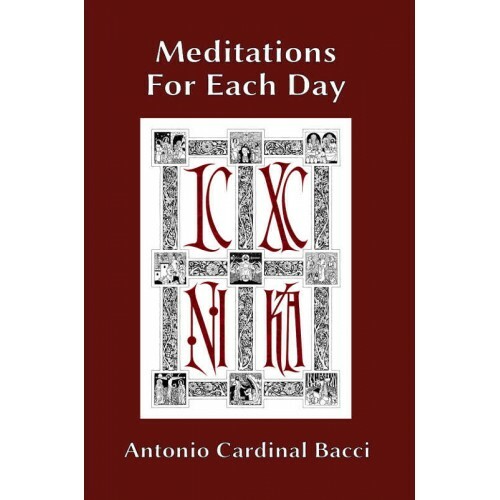 This book consists of a series of daily meditations written by the eminent Latinist Antonio Cardinal Bacci (1885-1971) who served as the Vatican's chief Latinist for over 40 years. The English edition has been out-of-print since 1965. In it, Cardinal Bacci explores vast areas of Catholic principles on the spiritual life using such sources as: Sacred Scripture, the writings of the Saints with particular emphasis on St. Thomas Aquinas, the Church Fathers, many passages from Thomas a Kempis' "The Imitation of Christ" and other spiritual authors. "As for the present edition, we have decided to make a few changes from the original English edition more in terms of style than substance. We have eliminated all of the footnotes from the original edition and have inserted them into the body of the text instead. When possible, we have made the references clearer so that the reader may easily refer to them if he so desires. We have added a Works Cited page so the reader can see a list of the works Cardinal Bacci has used. The reader can use this list to explore or study those works in more detail. All of the Scripture references have been given a uniform style. We have tried to correct all of the spelling mistakes found in the original text. In addition, we have added an English translation to a long passage from St. Bernard of Clairvaux that was kept in Latin. We expanded the Table of Contents to include all of the meditations. Finally, we added an editor's note to three entries: the nature of the Pope's authority, the relationship between faith and mortal sin, and the teaching on venial sin (January 20, The Pope; April 23, Faith and Charity; October 14, The Ascension of Jesus into Heaven). 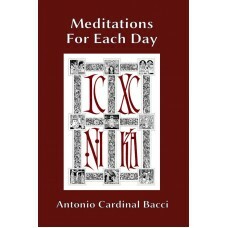 Given the English translation which we used and the devotional nature of this book (it is not meant as a theological treatise), we thought it wise to include those notes to avoid any possible misunderstandings of Cardinal Bacci's words."